Huddled in the rolling belly of the ship, Albinus re-read the message he’d been given in an effort to distract himself from the rolling in his stomach. Months on the road had inured him to travel, but for a man born and bred in a city where the land stayed still pretty much of the time, the road over the channel was not proving enjoyable. A voice on the deck above called out a command, and Albinus felt the speed of the ship finally slacken as it began to tack in to the harbour. He rolled up and carefully slotted the scroll into its case, and tucked it into a bag under his cloak. With one foot he nudged the sleeping form on the low cot below the bench, which groaned and curled tighter into itself. ‘We’ve arrived,’ he announced, and at the sound of his voice the figure pulled itself upright and, wobbling, lurched to its feet, the thick sheaf of brown hair falling back to reveal the pale and green-tinged face of a young woman. Other passengers began standing, green-faced or offensively sprightly, and gathered their luggage. The young woman, known since joining Albinus’ household as a child as Sasticca, shouldered a large pack, and made it up onto the deck, down the gangplank and onto the cobbled harbour square before dropping it to the ground and collapsing on top of it with a heartfelt groan. Albinus gave his slave a few moments to gather herself together as he took in the last country on his journey, seeming at first glance much like any other in the Empire. Behind the familiar offices, inns and clustering apartments though was a new landscape. The hills shouldering the town were steep and mist topped, and behind them curtains of rain fell, even now blowing towards the sea in great gusts. To the right through the rain and mist he could make out glimpses of white, no doubt the cliffs he’d have seen on the crossing if he hadn’t been sheltering below decks. ‘Come on, we’ve got a job that needs doing.’ He commanded after a little while, and then strode up the main street through the town, followed by the woman trying to find a balance between carrying his travel pack, not slipping on the cobbles and not being sick. At any moment, she was sure, her stomach would come up and that would be it for her and her cleanest travelling cloak. The crossing had been worse than even the bar slave at Caletum had said; no wonder Julius Caesar had had such a rough time of it. And he probably hadn’t had to sleep on the floor. They soon reached a fine looking inn, not far from the walls of the fort. Despite their knocking and calls, there was no answer however. ‘It’s not even a quiet time of year,’ Albinus ranted, as they stepped out into the rain and wind, which was coming now in regular fits and bursts. A woman passing by looking up at them, and then shuffled over, ‘You’re trying to get into the Cliffs of Dubris, then? It’s closed today, been closed all week in fact. Strange business if you ask me,’ she added with disapproval, her odd accent lilting over the Latin. ‘If you’re looking for somewhere warm, you can’t go wrong with the inn at the lighthouse. It’s just up there, not more than 10 minutes.’ She pointed behind them, up one of the hills crowding over the town. At the top they could make out a glint of fire, almost lost in the daylight and weather. ‘Tell them Camilla sent you,’ she smiled, nodded and was soon lost around a corner. Slave and master exchanges glances, and then turned on the path leading up the hill. As they crossed the small town, they could make out locals sheltering in the lee of bars, bakeries, food stalls, a furniture warehouse and even a small book store. They stopped at one counter to snack on cheesy bread and soup, where locals rubbed shoulders with other visitors and tried to warm up from the inside. As they climbed the hill, snatches of sunlight made it through the clouds, lighting up the trees and the sea which they could now see spread below them. The lighthouse, rather than a tiny colonial mound, was a tall and impressive structure, recently built enough for the bricks to shine slightly in the sun. 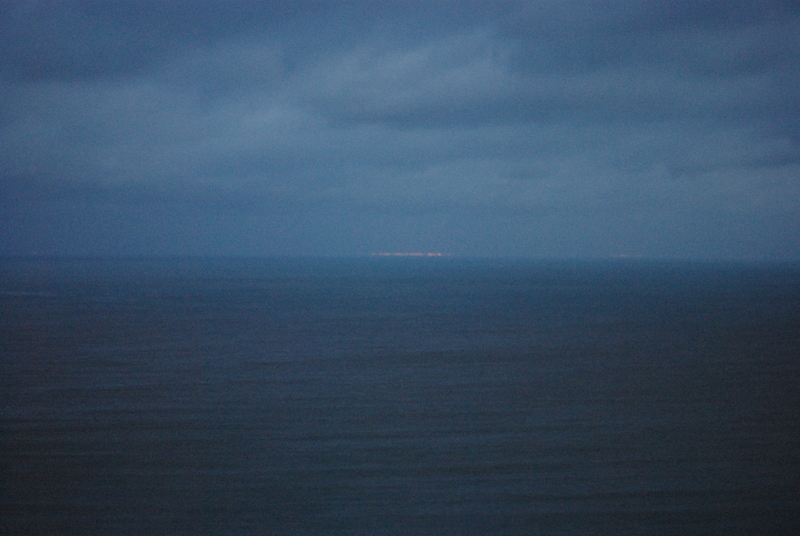 At the top, figures moved around, tending the light and looking out to sea, and voices echoed inside its thick walls. Less impressive was the brick building squatting next to it, probably the inn they’d been directed to. While Sasticca went inside to make arrangements for their stay and horses the next day, Albinus gazed up at the lighthouse wondering at the Fate’s decision to lead him to this backwater of the Empire, where even here the relentless energy of the old She Wolf could be felt. Though perhaps not forever, if the message he carried from the Emperor to the struggling commanders in the limitless north of the island reached them. For now, he thought, staring out across the narrow sea, I’ll enjoy the walls of civilization that will keep the foreign weather out and underfloor heating in. The boy in question didn’t pause in his breakneck dash up the castle steps. Ducking into an alcove on the staircase he just avoided a small troop of knights, heavily kitted out and liable to mow over any undersized servant brat that got in their way. As their footsteps faded overhead he ran up the last flight, and hid behind a wall hanging before anyone could spot him. From there he could hear the shouting of the knights that had passed, as well as a whole array of lords and dignitaries, each trying to make themselves heard over the raucous sounds of servants bustling, nervous horses in the keep and the usual life of the castle. ‘He has already taken London, and soon Kent will fall, we must move now!’ One voice rose above the rest, and then a silence fell as someone entered the main hall, their footsteps ringing on the stone floor. Muttering and some scattered applause followed these words, and then voices rose again as tactics and plans were discussed. It was high summer, and any day now the army of Prince Louis of France would arrive and crash against the walls of the castle. Having heard all he needed to hear, Will peeked out from behind the wall hanging, ready to make a break for the stairs. 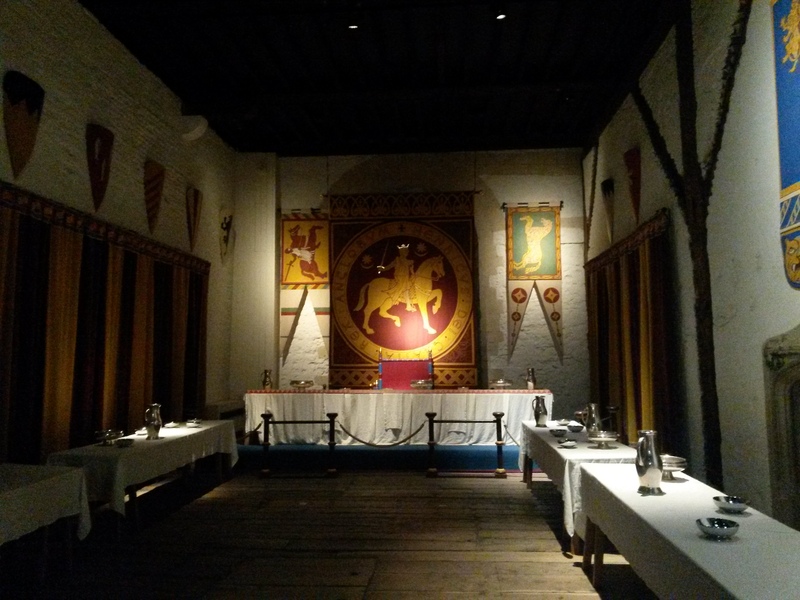 The long tables in the dining hall, where he was hidden, where being scrubbed and set by a small army of servants, who also swept the floors and dusted brightly coloured banners hanging above the high table at the far end. To his right through the open arch connecting the rooms he could make out the crowd gathered in the main hall, where the thrones of the King and Queen of England waited, and where the worthies of the castle gathered to plan, argue and debate. Beyond that was the room that the Constable had set for himself in the absence of the King. Will had never made it past the main hall, on a dare late at night, but other servants had spoken of a large, fine bed, warm furs all over the place, a special room just for treasure and everything done in the brightest colours you could think of. It sounded a world away from Will’s hay-strewn corner in the kitchen downstairs. Just then a face turned towards him, and before the other servant could shout he’d escaped and charged down the stairs into the kitchens. Once there Rolf the baker grabbed him before he could make it outside and pushed him in among the other servant boys who were helping with odd jobs. He found himself fetching water, grinding barley, salting fish and soon lost track of what he had been doing before being caught. It wasn’t till dusk was falling that he remembered. Looking around furtively, he saw that there was no one watching, put the butter he’d been patting into form in its box, and slipped out, up the stairs and into the keep. His cap was almost blown off in the strong winds, which blew the heady smells of the kitchen and the stables after him as he ran through the clusters of men and women finishing their tasks for the day and out through the gates. No one paid any attention to him, and he’d made it all the way to the old watch tower before someone called out to him. He looked up the tower and saw his little sister Phillipa peering down at him, hair streaming out behind her. His sister frowned, nodded and then ran back through the fading light to the castle. Will turned back to the tower and the sea behind it, then ran and slipped down the wet grass of the hill and onto the path heading west. Carts and riders passed him, throwing up mud and almost trampling him a few times, so he stuck to the side of the path, covered in weeds. As he trudged the light faded and he felt sure he’d never make it in time. Then he finally reached the small turn off from the main road and followed the winding path up the hill to a grassy, tussocky, windy field overlooking the sea. As he climbed, he looked ahead and saw the great white cliffs, mottled here and there by greenery, but almost seeming to glow in the fading light. 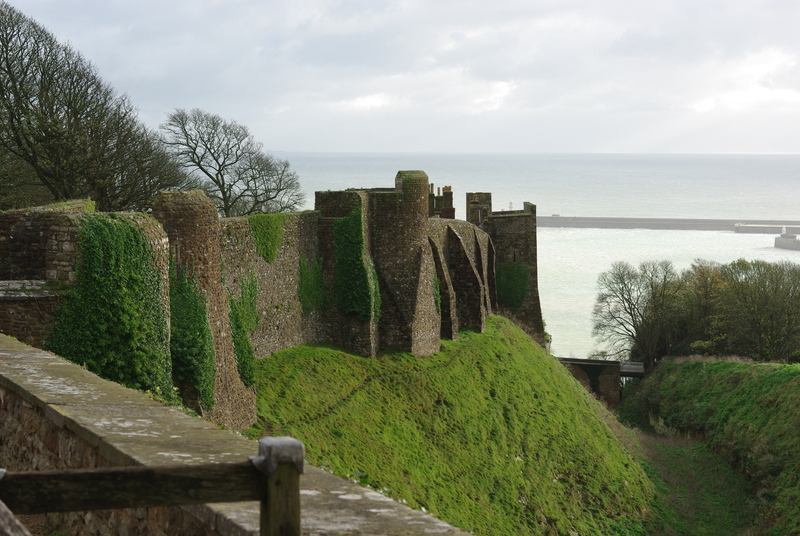 He remembered his mother bringing him here, in the few short years he recalled before she died, and telling him that no army that came across the sea to Dover could face the tall, ghostly cliffs, but would turn back in fear. He’d believed her, 3 years old and too in awe of adult wisdom and those mighty cliffs to imagine it could be otherwise. 6 years later he knew better, not trusting in adults or cliffs to keep him and his sister safe. A nearby whinny brought him back to his mission, and he turned his back on the cliffs and scrambled amongst the bushes and shrubs until he found Albina. She was munching contentedly on grass, and seemed unsurprised to see him. She whinnied again, tossing her white mane about her short, furry neck. Untying his rope belt, Will fashioned a halter and after passing it over her head began to lead her back down the path. 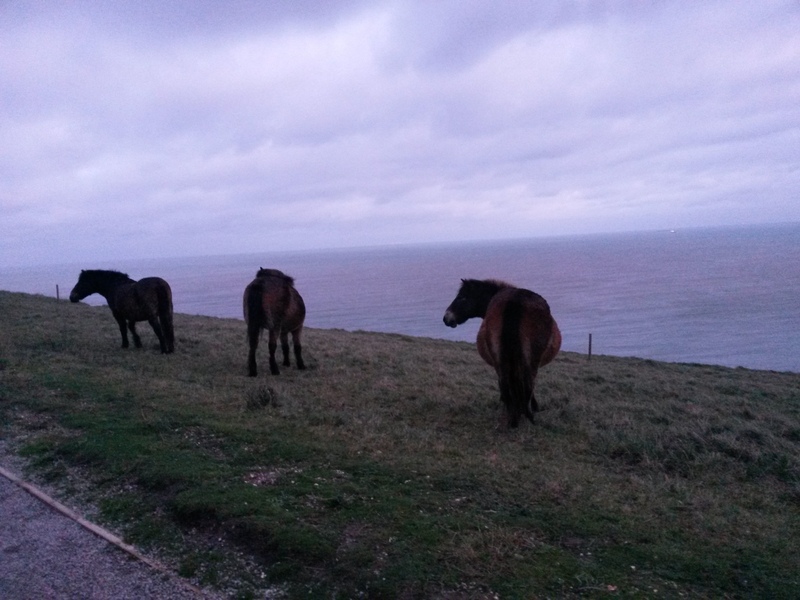 Other ponies watched them go, ears twitching and then distracted by hunger returned to their own business. ‘You can’t stay out here tonight, girl, not with Prince Louis coming. Huw said the French would eat anything, so they probably wouldn’t be able to resist ponies, especially ones as pretty as you.’ So saying he patted the thick, white fur of her neck, burying his hand in the warmth. If he was quick, there should be a back corner of the stables with enough space for a quiet, tamed wild pony, especially one that was so obviously lucky, with fur the white of the cliffs and the sense to come in when a French army approached. They had both been lucky, him and Albina, and Phillipa too, and even if the castle fell – which it wouldn’t, not with those huge walls and the old tower built by giants from long ago – there were ponies on the cliffs that they could hide among, and secret caves on the beach that their mother had shown them. In the distance ahead a light was lit on the tower, guiding him home. 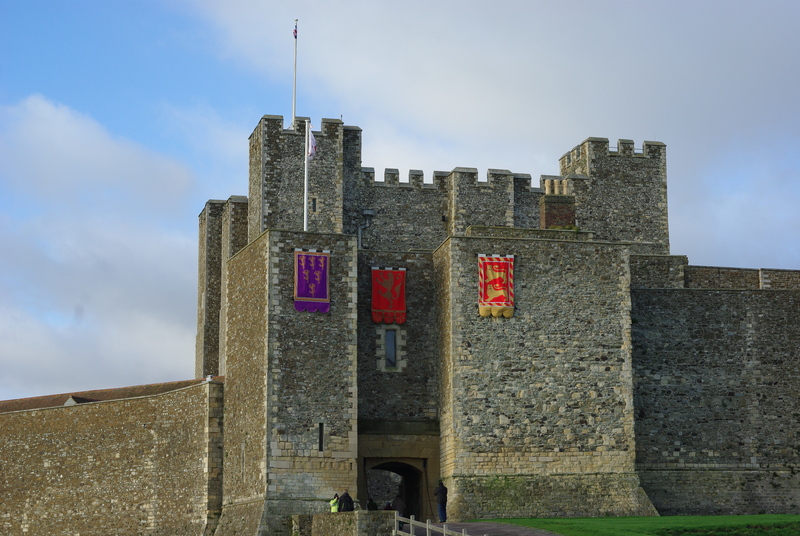 This post is a little bit different from my usual reports of our travels, but the history and sense of place that I felt at Dover kept drawing these stories out and I couldn’t resist. When we visited there were no Roman messengers wandering about, but there were the remains of what is thought to have been an inn, which we were unable to get into. A helpful lady directed us to the castle instead, and after the snack described in the first story, we eventually found the old Roman lighthouse. You can still go in, though the steps to the top are long gone. 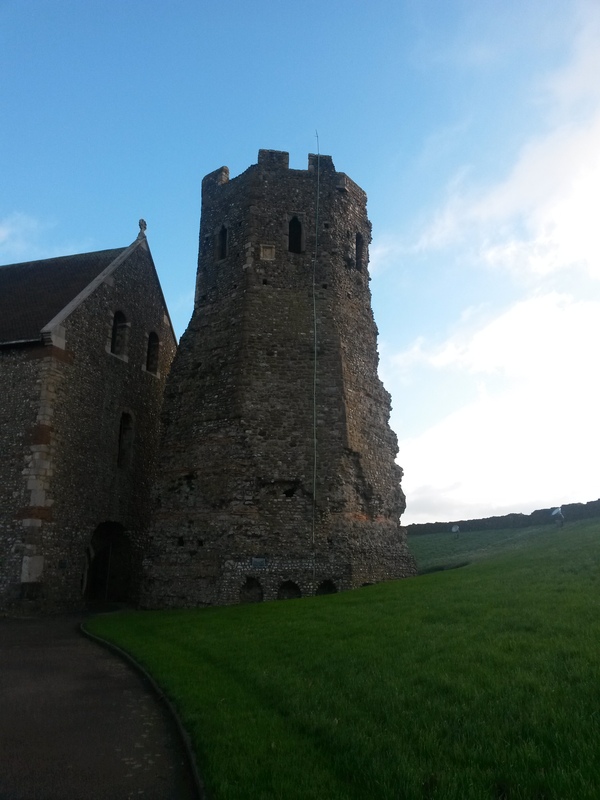 It was in use for a long time afterwards, when people had largely forgotten about the Romans, and in the meantime Dover castle was built around and behind it. The castle in incredible, the largest in England and amazingly intact. 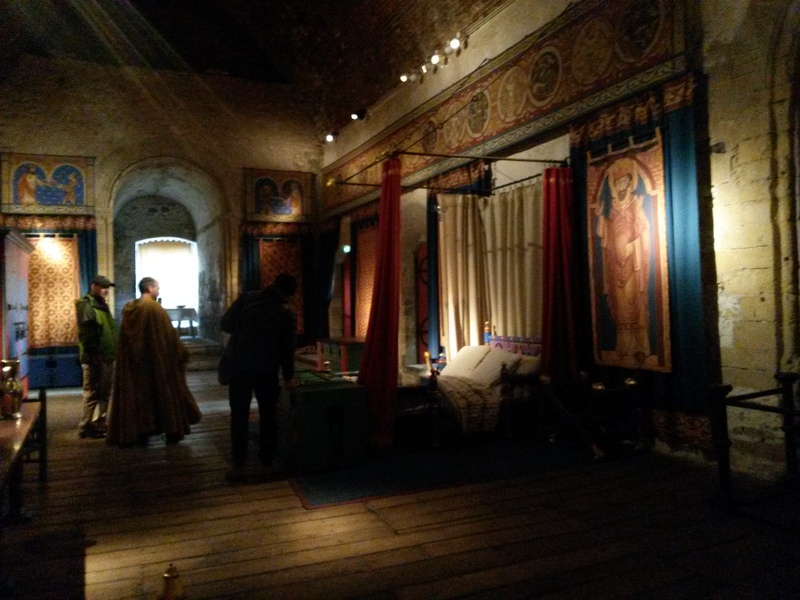 The kitchens have been filled with models showing how it would have looked, and each floor had rooms fully furnished and decorated in bright banners, tables, chairs, chests and re-enactors. 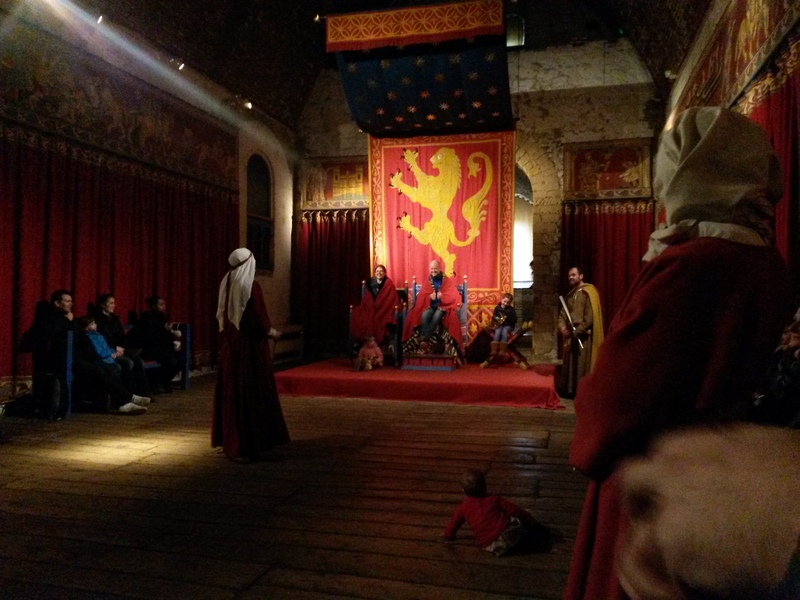 While we were in the great hall they put on a performance, making some visitors the royal family for the day, and leading us all in a dance to honour the king and queen. It was a lot of fun, and became yet another memory from a holiday full of wonderful memories. 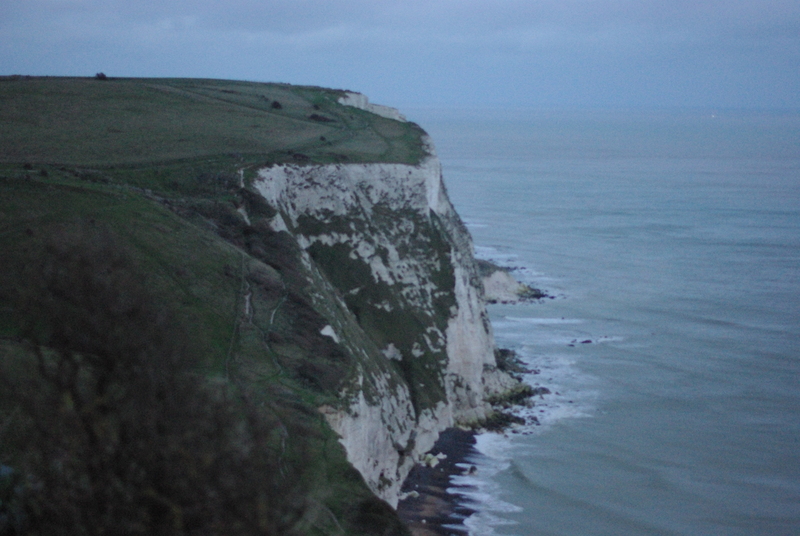 By the time we left the castle it was getting dark, and so our walk to the cliffs, along the side of a road without a footpath, wasn’t the most pleasant but we made it in time to see them before the light entirely disappeared. They were tall and impressive, and someday I’d like to go back and climb down onto the beach to look up at them in full daylight. There were also many wild ponies. So I hope you will forgive my indulgence in fiction and history and take my recommendation to visit Dover yourself one day, and see if you can find ancient foot steps as well. Though my previous post may have lead you to believe otherwise, there is more to London than just staring at fascinating and ancient artifacts from around the world. Before I get into that and continue our adventure from the portico of the British Museum, I have a joke relating to an item at the museum to share with you, dear reader. And then we laugh. I came up with that joke all by myself, though I have to say that the first listener didn’t give me quite the response I was after. Some people just have no taste. Anyway, having left the museum (and material for other hilarious jokes) behind, we continued down to the main street, further into London. As we went I noticed plaques on the walls of the very typical townhouse frontages, one of which stood out especially. It was dedicated to Dame Millicent Fawcett, who as I’m sure you know, was President of the National Union of Women’s Suffrage Societies (NUWSS) and played an important role in the campaign for women’s votes. History really is everywhere. We walked for a while, taking in the bustle of tourists and locals, the black cabs and double-decker red buses and ye olde style pubs. Soon we found ourselves in Leicester Square, which seemed to to be heart of the West End. Wherever we turned, huge posters for shows loomed above us, some familiar and some new. We headed to one of the last minute booking stands, and after some discussion, booked tickets to a certain musical for the second last day of our stay. There will be more on that in a later post, and yes, it was fantastic and not revolting at all. It seemed now that we were starting to slip into the more well known parts of London, the streets and squares featured on endless tv shows and movies. One of the most recognisable squares also waited just ahead of us as we went down towards to river from Leicester Square. All of a sudden, a huge column topped by an old fashioned looking gentleman came into view, and beneath him was spread a place that I have seen so many times that I felt a sense of deja vu. It was also bigger in person, the fountains on either side more like elaborate paddling pools and the lions under Nelson’s Column many times larger than life. At the time it was too dark to properly make out the statues on plinths around the square, but something that was well lit up was the National Gallery, sitting becolumned and huge behind the square. It was closing as we arrived, so we put that off until another day. In addition to the tourists and locals hanging about and climbing the lion statues, there was a collection of flowers, candles and waterlogged posters huddled next to one of the fountains. The words ‘Je suis Paris’, #endhate and the tricolour in various forms were almost lost in the darkness, lit up by the light of the fountain and the flash of cameras. And if you’re wondering, no we didn’t notice a huge amount of security, no more than the serious clusters of bobbies that I imagine would usually stroll around busy areas. From the square, as we turned our backs on the National Gallery, a familiar clock face appeared in the distance. Not having any other plans, we headed towards it, dodging crowds, crossing busy streets and passing endless pubs and theatres. The Houses of Parliament, Westminster Abbey and Big Ben were all as impressive as I’d thought they would be, lit up and seeming to have just jumped out of a guidebook. There was also one final sight that I wanted to take in, one that isn’t on the front pages of the guidebooks. The Stone of London. I’d heard about it in the novel Kraken, by China Mieville, and then found references to it in guides to obscure sights of London. It’s origins are mysterious, from a Roman mile stone, the foundation of a bath house to the remnants of a medieval wall, and has been mentioned in travel guides from the middle ages to the 18th century. In the 14th century the leader of a rebellion against the king swore an oath on the stone before going to war (he failed, though it probably wasn’t the stone’s fault), and it was commonly believed to be the heart of London. If it was moved, so it was said, the city of London would fall. It’s now located behind a grating in the wall of a convenience store, with only a small plaque and the neighbouring London Stone pub giving away its location. Maybe in another 2000 years it’ll still be there, slightly more reduced and unimportant looking, dragging myths with it into the future. After all this adventure our feet were starting to hurt and our stomachs were rumbling, so we sought out dinner and drinks and then went home. By the time we made it back, sleepy and tipsy, the name of the train line that we had to catch was completely hilarious. It kept us going at least halfway home. It’s a strange contradiction, that one of the cities whose landmarks and streets I have known as well as my home city hasn’t been on the top of my list of places to visit. Rome, France, Spain, Japan, New Zealand, Istanbul, Malta – they’ve all been ticked off, but somehow that one city lurking in the background, all foggy streets, lamplight, theatre and history, just sat there quietly, waiting, as overlooked as the back of my hand. Last week I finally made it there, and I should warn you that I have collected enough memories, history, stories and material for at least three posts. Until the next time we visit. So without gilding the lilly, while I may have the body of a woman I have the heart of a man, so we will keep calm and carry on, the unspeakable in pursuit of the uneatable, and despite my love of the sound of deadlines as they whoosh past we shall get on with it (‘Yes, get on with it!’). My first impression, as we stepped off the train at Liverpool Street Station, wasn’t darkness, creeping fog and dirt, but the pride and elegance of the Industrial era towering over a living city. Having been recently renovated, the iron columns of the old station loomed above us, topped with delicate lattice work buttresses and supported by painted palm bases. Far above was a semi-transparent ceiling that let in enough light to give the building a glow but not enough to see the clouded sky. It was a good first impression. 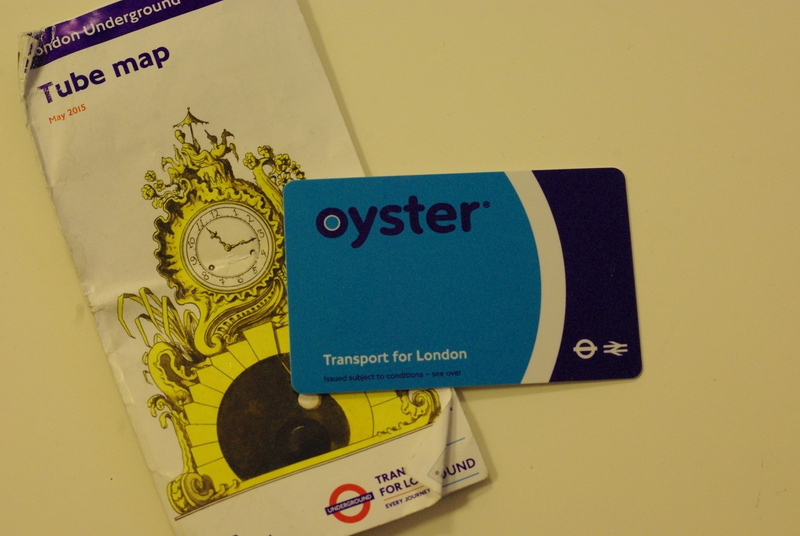 From there we made the most important purchase of our trip; oyster cards. I cannot overstate how useful these are, to be able to unthinkingly breeze through the gates of the tube or onto buses with a little, satisfying blip. The second most important thing we collected was a map of the underground. These were both worth their weight in gold. So it was a simple thing to make our way to the airbnb accommodation, settle in and make a plan for the evening. My partner had, predictably, looked up the location before and sussed out the local pubs and breweries, of which there were many, so it was to one of these that we headed for our first night. The pub was loud, warm and bracingly welcoming. However, within 5 minutes of stepping inside we had committed our first cultural faux pas. To us, a space at a table with empty and half-full glasses means that someone has left without finishing their drinks. But au contraire! Here it meant that the drinkers in question were outside smoking, and had left the half-full glass as a sign that they’d be back. Muttering apologies we escaped and found a new spot, where we excitedly ordered our first sausage roll in years and I enjoyed a very hot, very clovey mulled cider. ‘To London!’ we cheered, clinking our glasses together and settling into the beaten up old couch. So, knowing me, as many of you readers do, what would you lay your money down as the first place we’d visit in London? If you guessed the National Gallery then no, but you’re close. If you guessed the recently opened Jack the Ripper museum, then frankly I don’t think you know me as much as you think. 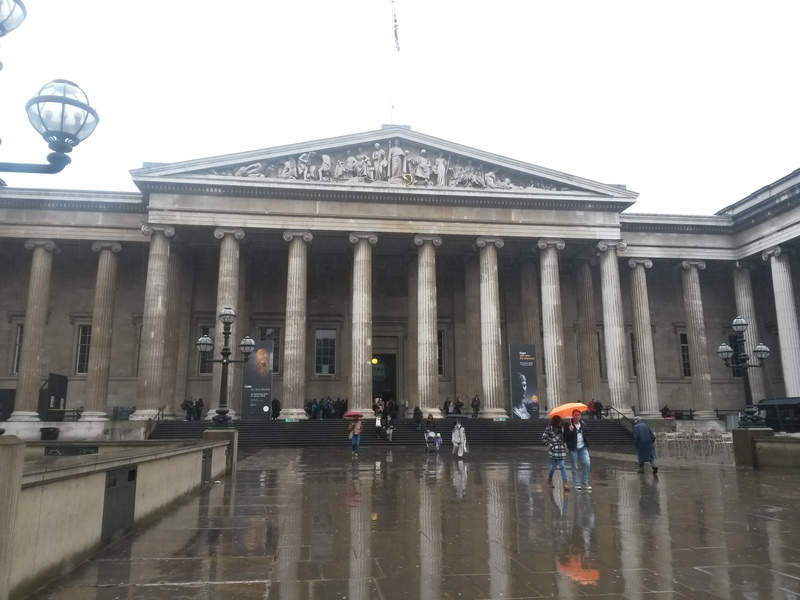 If you guessed the British Museum, then well done! You win the prize of my esteem and a detailed description of my visit the next time we meet. Be prepared for enthusiasm and jazz-hands. There is a piece of stone that I have wanted to see for most of my life, at least since I was 8 or 9. I’ve seen a copy and left a flower on the grave of one of the men who worked with it, in Paris. It is one of the most important artifacts in the world, and enabled us to open up a part of human history that had been partly hidden behind mysterious symbols for a very long time. 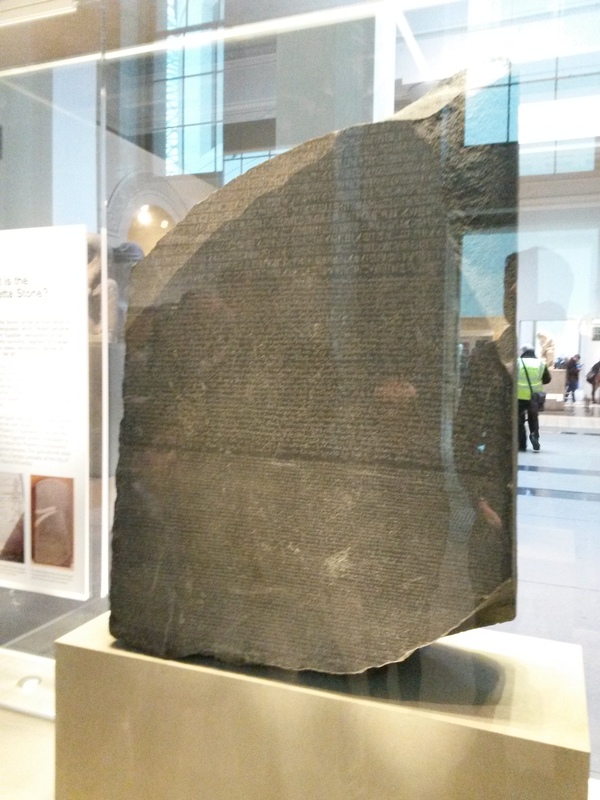 It was, of course, the Rosetta Stone. I am, however, a person who enjoys drawing out the anticipation, so it was to the right, and the Assyrian gallery that we headed for first. There we found the reconstruction of a massive door, cuneiform rolls and semi-human statues staring down at us. The most interesting for me were the panels from the palace of Ashurbanipal II in Nimrud. They showed hunting, war and the gods, typical stuff, but something about the finely detailed curls in the beards, the lone, perhaps baffled fish in the river crossing scene and the delicate beauty of the gazelle being offered up to the king charmed me. We spent a while there, staring and absorbing, before we slipped into the Egyptian gallery. It didn’t take long to spot the Rosetta stone, mostly surrounded by school kids and tourists and looking exactly as I’d imagined. It was a very special moment and the culmination in a way of a lifetime of immersing myself in history. 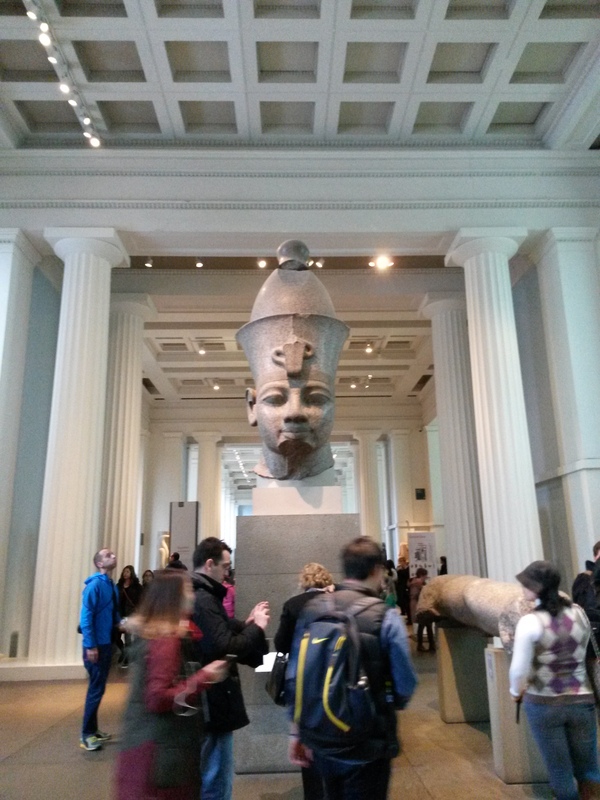 Also in the Egyptian gallery were reliefs, sarcophagi and monumental heads of Amenhotep III and Ramses II. The latter especially looked serene, sure perhaps that thousands of years later he would not be forgotten or left buried in the desert. The next part of the museum we ventured into focused on Greece, and it was here that my partner found himself unexpectedly entranced. 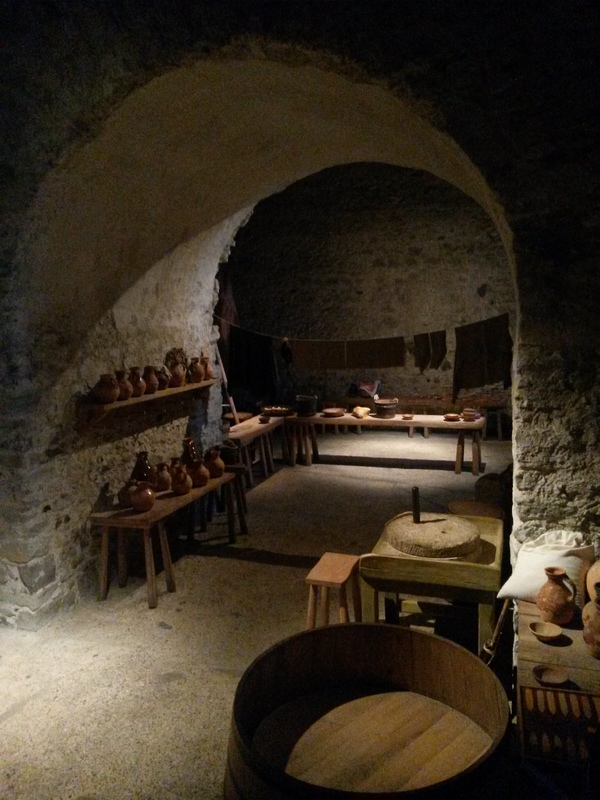 He’s recently completed a ceramics course, bringing home a selection of lovely bowls and plates, so the displays of ancient plates, amphorae, vases and jugs entirely grabbed his attention. And they were stunning. Almost all where in the black on red style, showing gods and heroes parading about, or mortals indulging in an amphorae or two of wine. The quality of the work was stunning though, often discreetly signed by the painter and the potter, and found in places as far afield as Campania in Italy and in Egypt. It reminded me of the fineness of Georg Jensen ewers, or other designer home wares that you’d be more likely to display on a shelf than actually use. Further on there were Corinthian helmets, one with a dent, Sassanid swords and statuary, but for me it was all a build up to the main event. I have been debating with myself as to whether to get into the politics surrounding the artifacts I’m about to describe. Though it’s important, for now I’m going to describe the moment so you can see what I saw, and someday I’ll get into the issue, perhaps when I’ve seen the original home of the artifacts. 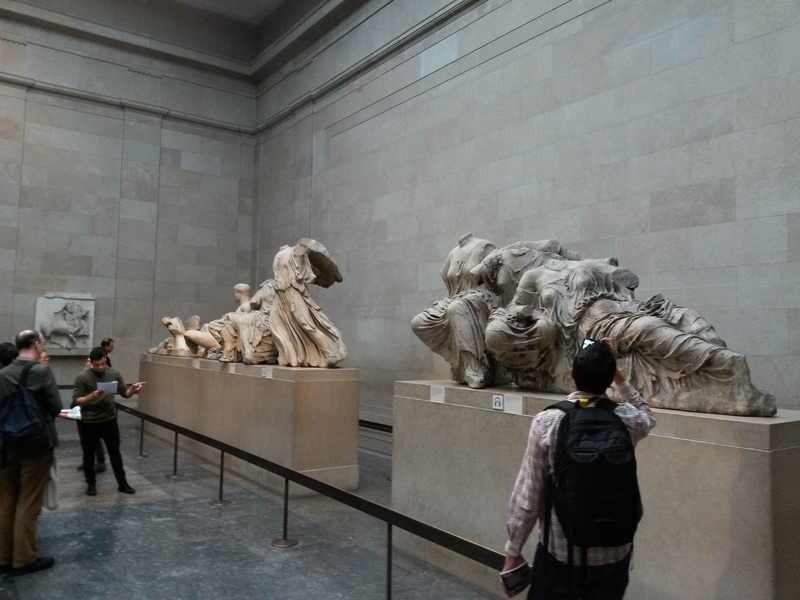 When I first heard of the Parthenon Marbles, or the Elgin Marbles as I first heard them referred to, I for some reason imagined then literally as big, white marbles. As in the round ones that kids used to play with, but white and smooth and a metres tall. I am, I fear, sometimes too literal. 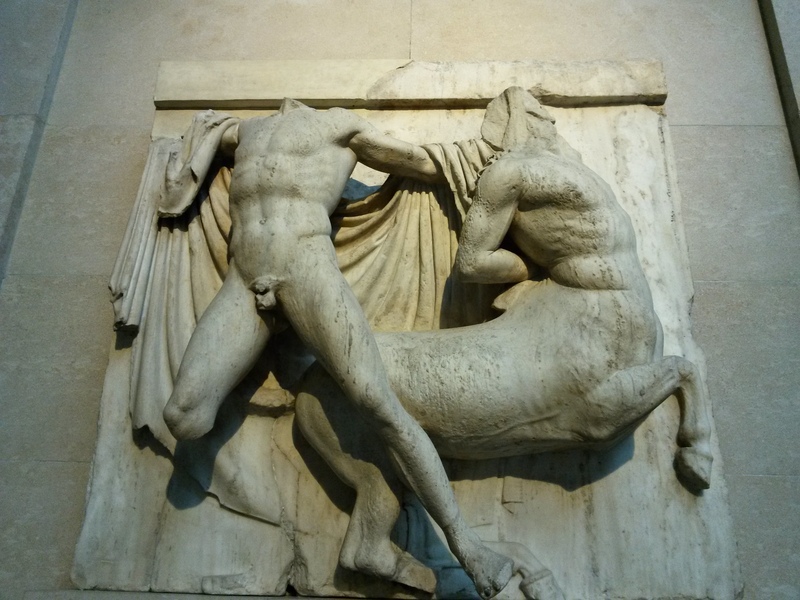 What they actually are, of course, are the friezes and statues that once adorned the Parthenon in Athens, carved of fine marble and showing at once the incredible artistic outpourings of the time and how difficult it can be to correctly interpret the people of the past. Most of the works show a cavalcade of riders filling up panel after panel with movement and life, the muscles and tendons on the horses and men seeming to thrum with energy even without the paint and decoration that would once have covered them. A parade was also taking place, with men and women tugging along heifers, sometimes against their will and carrying mysterious instruments for purposes that we don’t know. At the end of each room where large but fragmentary statues that once sat on the triangular ends of the temple. Neptune, and perhaps Aphrodite and Demeter lounge and sit around, headless and armless, the folds of their clothes caught in sudden movement. 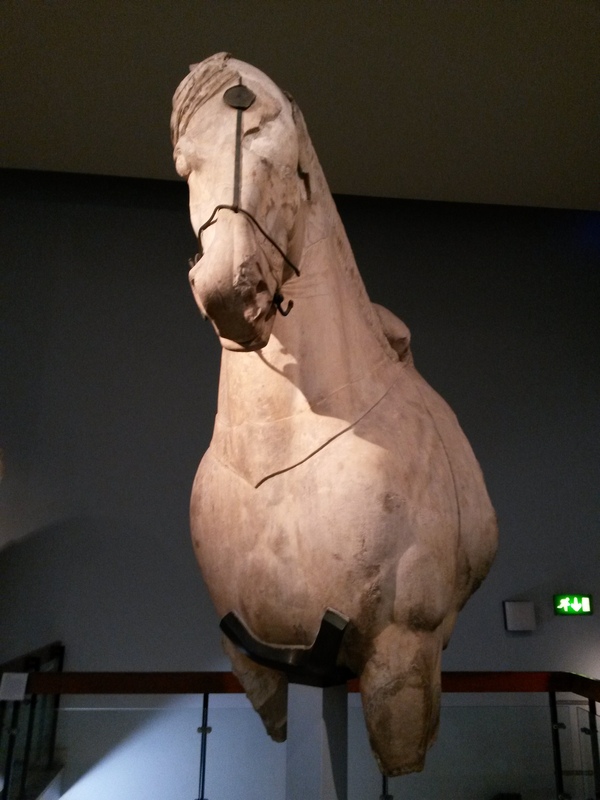 The heads of horses also perch on display, nostrils wide and eyes fierce, though their bodies are long gone. 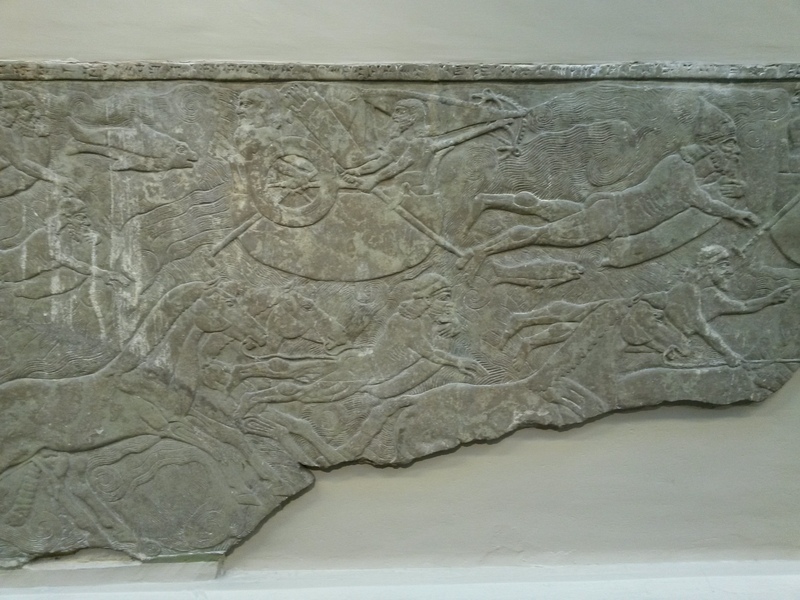 Finally there were the ‘Metopes’, panels showing a battle between centaurs and Lapiths. Again and again a man and centaur were shown locked in battle, always at a critical moment. It felt as though in the moment of sculpting the fight could go either way, the stone clutched in one hand could fly into the enemy’s face or a spear could be turned aside. In addition to the fine artistry, they seemed to live and tell a story, if we can only work out the message. Having left the world of classical Greece, we found ourselves sharing space with fragments from the Mausoleum at Halicarnassus. If you’ve ever wondered where the word mausoleum comes from, look no further. In the 300d BCE a woman called Artemisia commissioned a massive tomb for her husband Mausolus and herself, which became one of the wonders of the ancient world. Though they were part of the Persian empire she employed Greek architects to design it, and the fragments that are left show a mix of both influences. 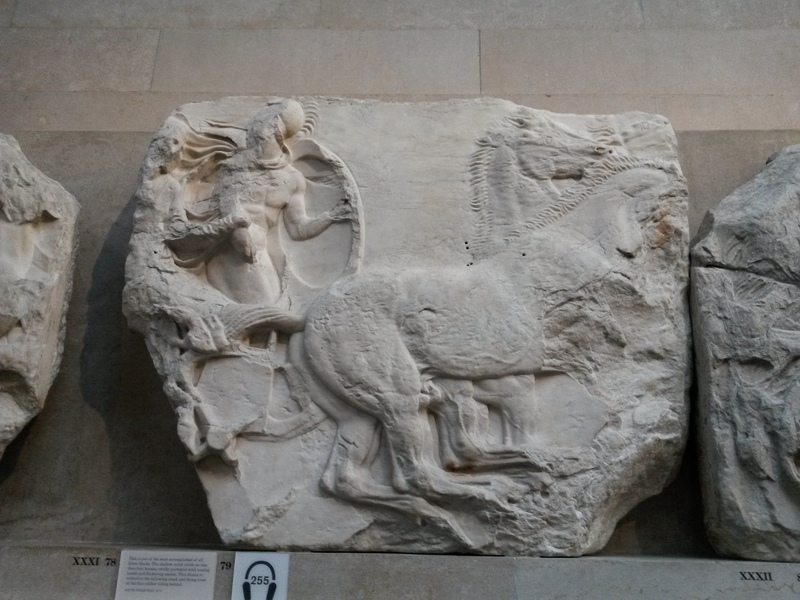 Two massive statues remain, possibly of Mausolus and his sister-wife Artemisia, but the most amazing piece in my opinion was the head, shoulders and part of the legs of a horse that once stood with three others in a chariot on the roof. It was simply huge, towering over me as it once did over the city. 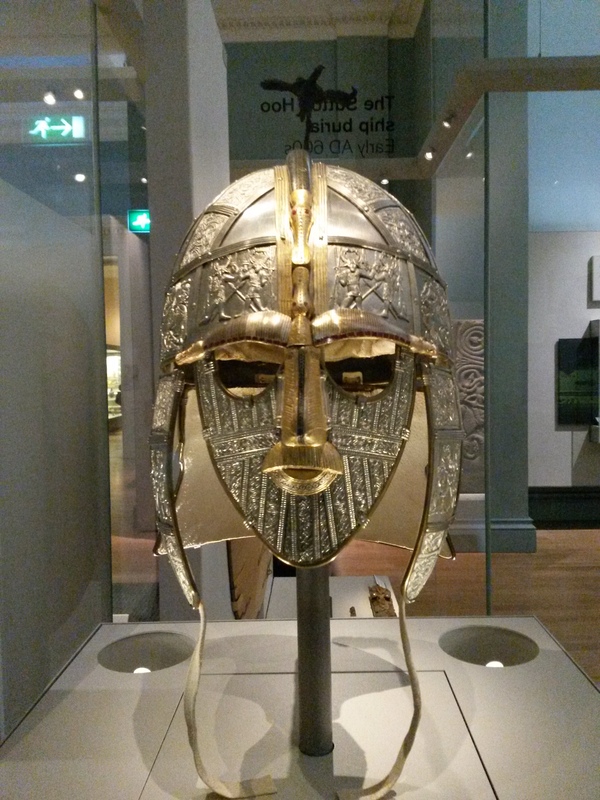 Then there was the Celtic room which turned into the Romano-British and then Viking gallery. 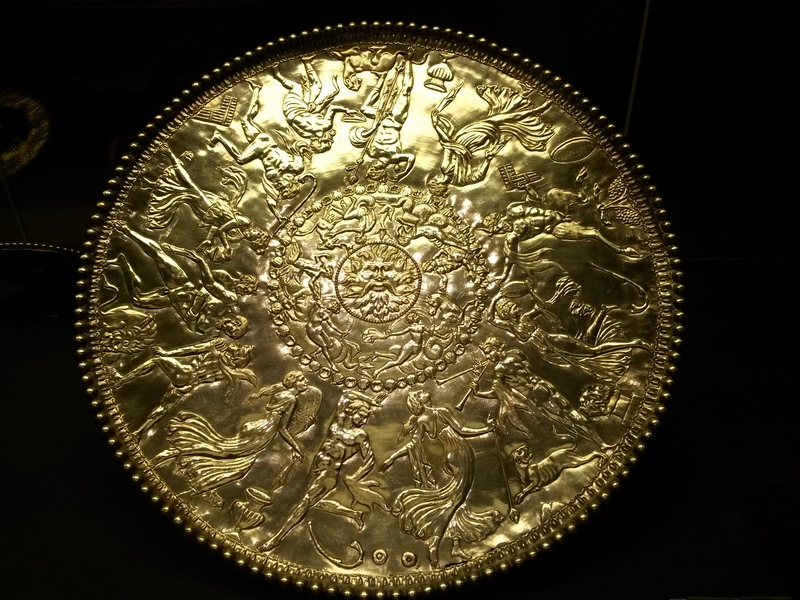 It included incredible dishes and cups from the Mildenhall find, a delicately made chest chain probably worn only once by a very young Romano-British bride on her wedding and a seemingly unimportant letter from the Roman period. I shall expect you, sister. Farewell, sister, my dearest soul, as I hope to prosper, and hail. 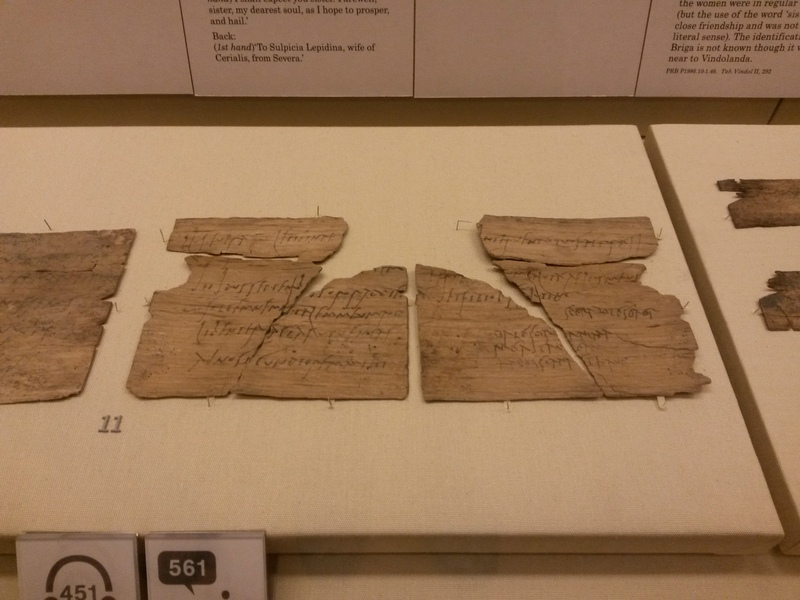 This letter is thought to be the earliest known writing in Latin by a woman, and I adore how innocuous it is. And at the same time showing the love and life of real people, and everyday life. I hope Sulpicia made it to Claudia’s birthday. At the end of the long room were the treasures from the Sutton Hoo burial. 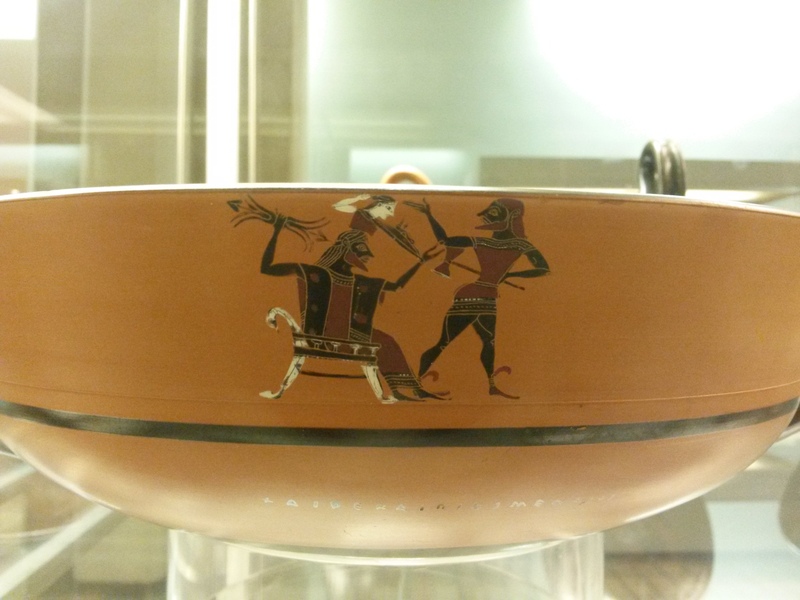 I’ve known about these for a long time, but somehow the fact that they were in the British Museum had slipped my mind until I read up about the Museum prior to visiting. Knowing that I was eager to see the treasure, in particular the helmet, my partner told me to close my eyes and turned me around to see it when he spotted it before me. 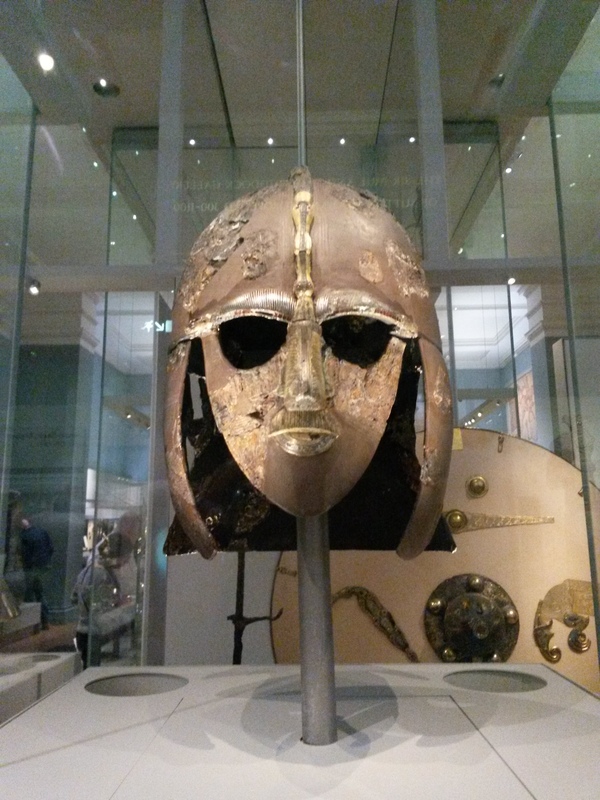 I saw first the reconstruction, a beautifully made helmet of silver, inlaid with precious stones and decorated with symbols from the Roman, Celtic and Viking worlds. To the side was the original, much reduced, but with the decorations still visible. Even though no one knows for sure who the man buried with the helmet was, he was lucky to have incredible craftsmen available to provide treasures to take on his final journey. 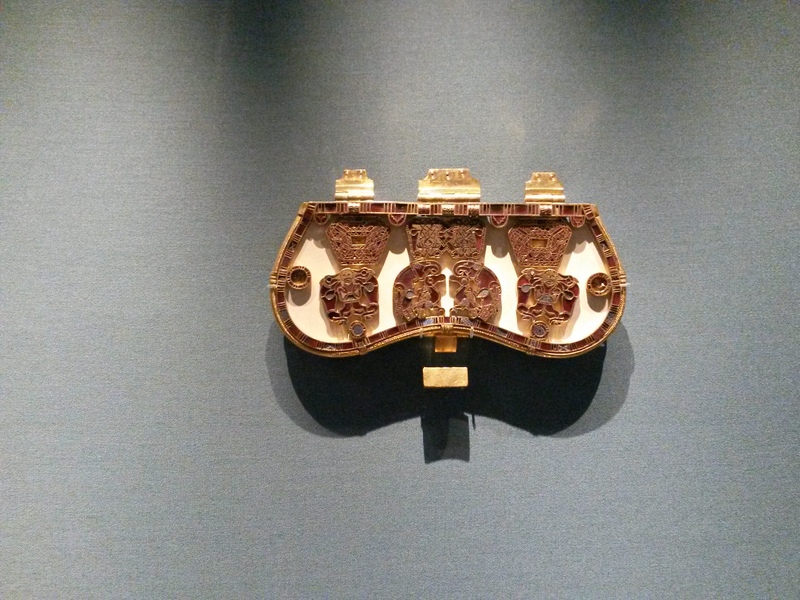 As well as the helmet, was the clasp of a purse, a brooch and buckles, made of gold and gems and of the sort of quality I’d expect on the catalogue of a professional jeweler today. It goes to show that despite the prejudice about those who went before us being somehow less able due to the limitations of technology, they were just as capable of creating beautiful things, simply and confidently. By now we were tiring, and the wonders of the past were starting to blur together a little, so we headed to the exit. On the way out I bought something which I felt symbolised my impressions of London, at least prior to visiting; a compact umbrella decorated with writing from the Rosetta Stone. Armed against the likely rain, we went out and continued our first day in London. Posted in Holidays, Travel outside of Sweden, Vikings! I write this latest update inside the apartment, as the weather outside fretfully decides whether to continue with the wind and rain of this morning, or return to the sunny skies that I’ve become used to. I fear that in returning from across the seas last night we may have brought with us the wind and rain of England. Sorry Göteborg. It was not all rain and bluster fortunately, though I think the fact that the weather lived up to my expectations of the typical, cliqued sort of conditions I’ve heard so much of was a bit satisfying in an odd way. So what were we doing in England you ask? Well, before we’d even left Australia my partner had heard of an annual airshow in Southport, which includes some of his favourite airplanes, and which he was pretty eager to go along to. Göteborg being a mere hop, skip and jump from England, we duly made plans and bought tickets and so last weekend popped over to see the show. I’ve wanted to visit England for as long as I can remember, seeing it as the home of many of my ancestors and a large part of the culture of Australia. Plus Monty Python, Douglas Adams, Terry Pratchett, Dorothy L Sayers etc etc etc… The idea that Australia technically has a Queen also makes me geek out a bit, in a historical way. How Medieval eh? So, we caught the plane to Stansted and landed, all running more or less to plan and found the hotel. Morning arrived and so did we, though possibly not as quickly as we should have. By the time we were in our hired car and pootling up the M1 it was a bit later than planned, but after all, Google Maps had told us it would only take a couple of hours to get to Southport. No problem right? Guess. For all that it was longer than planned, it was a lovely drive. Traffic issues meant that we went on a small diversion, passing through small villages that were so very English that I almost didn’t believe it. Twisting streets, hedgerows, old churches, quaint double-storey houses and the most fabulous names, it almost seemed a parody of itself. 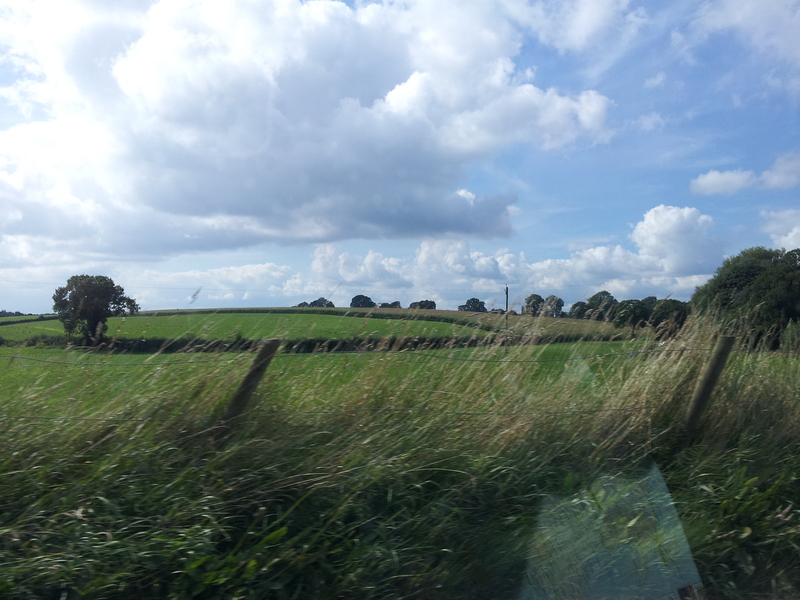 As we drove, the sky cleared and for much of the afternoon the fields and houses were bright and sunny. I also enjoyed reading out the names of pubs that we passed, such as The Bears Head, The Green Wheelbarrow and The Wrestler. I’d guess there would be a story behind each name, that would be as old as the buildings, or at least an invented tale. 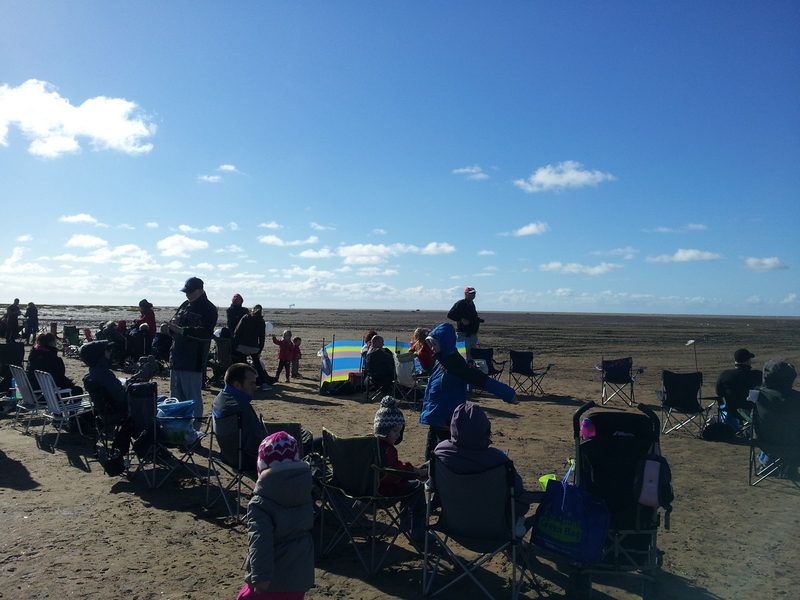 Though late, we did arrive in Southport in time for the displays that were most eagerly anticipated. Eventually making our way to the beach, we stood and watched and photographed the planes as they wooshed overhead. From the Typhoon, a modern jet that sounded as though it was tearing the sky apart, to a Lancaster bomber flanked by Spitfires in honour of the Battle of Britain, it was a very interesting show. The planes and helicopters eventually headed off into the distance, and so did we, venturing into town for something to eat and somewhere to sit. During our wandering I realised that without being really aware of it, Id become accustomed to the reserved, almost genteel manner of Swedes and being confronted by people who shouted questions at us and loud groups of swaggering sorts of men trailing young children and tired women was a bit of a shock. It felt like family night in Northbridge and I felt like a cosseted stranger. We did find a very nice hotel though, with friendly and gracious staff who also employed a very good cook. More relaxed and full of food we headed to Chorley, the closest place I could find accommodation an prepared ourselves for another early morning. I mentioned that the weather was typically English didn’t I? Well on the Sunday this trend continued, and as such the second day of the airshow was cancelled with the expectation of storms, so we hopped into the car earlier than the previous day, with plans still up in the air. If we returned the car in good time, I hoped, there might be time for a quick trip to London, but as we drove on and I checked times, this seemed less and less likely. Fortunately, as it turned out, our route back took us closer to Cambridge than the previous day’s drive, so we decided to stop there for lunch. After some traffic issues, we parked in the city and looked around. Where is the University? I thought, peering around for old towers and gates and finding only winding roads and old buildings. Then it occurred to me why I couldn’t find the University; the city was the University. I was right in the centre of it. The old buildings were colleges and campus buildings, and those young people trotting and cycling around us were students, tolerant of the peering tourists who must be often getting in the way. 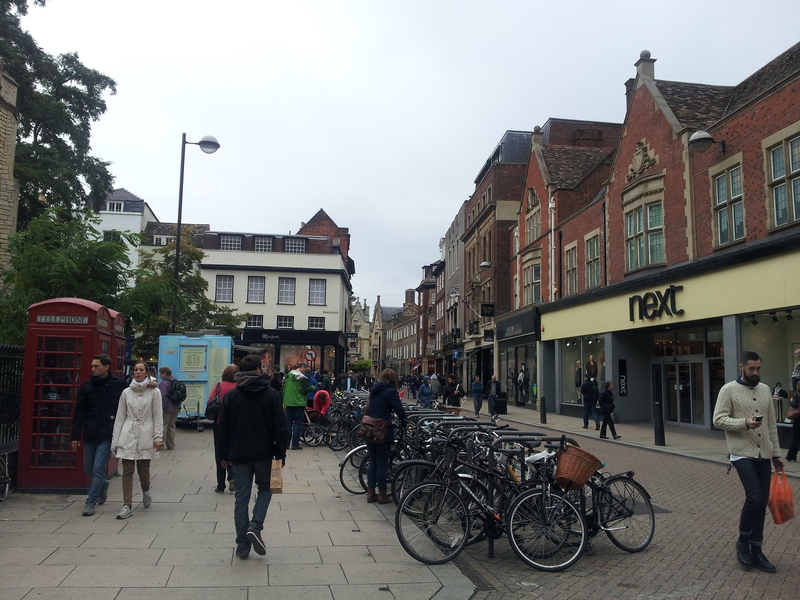 I decided pretty quickly that I very much liked Cambridge, with it’s mix of the old and the new, and rather than just stay for lunch we made an afternoon of it, wandering the streets and soaking up the atmosphere. 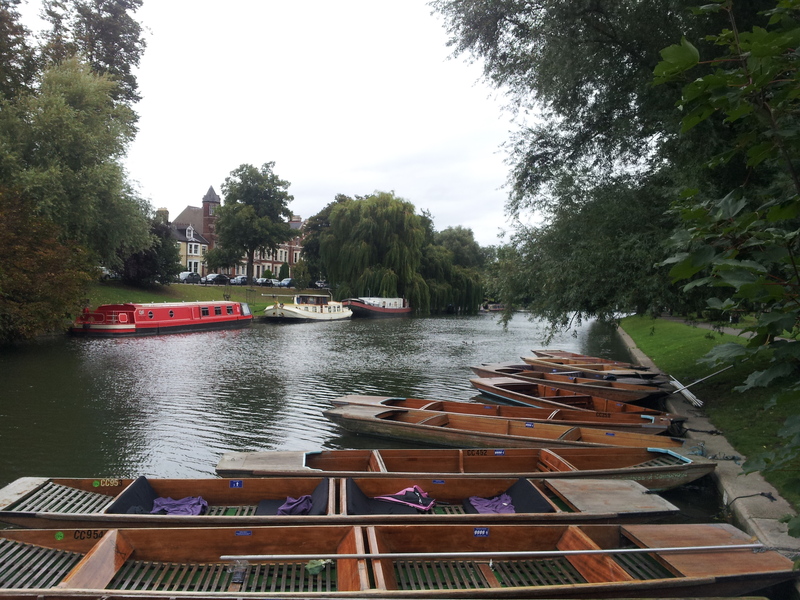 A particularly touristy activity we did was a punt up the Cam, guided by a student who had a lot to say about the history of the town and University, and in particular the colleges that we passed as we floated upstream. It was the perfect way to get to the heart of the town, passing the old houses of Trinity, Trinity Hall, King’s and Queen’s, and under the bridges. 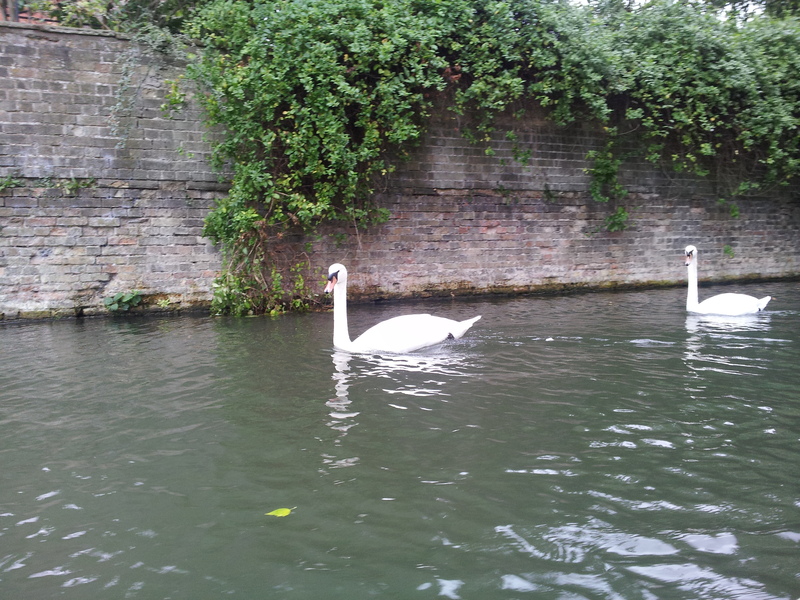 Some ducks and swans also joined us, as tolerant of us tourists as the students had been. After the tour we hurried back to the car to head to the airport, and managed through a little bit of speeding to get there only 30 mins later than planned, and after more running made it to the gate with time to spare. Then all that was left was to wait for the plane to take us back over the sea, and home. Tomorrow I am off again, this time to Stockholm, to hopefully find the house where my mum grew up, find something suitable for my brother’s impending birthday and general exploration. Adventures and another blog post are on the way!